Pressure sensors are often employed to handle extreme conditions such as high pressures, corrosive atmospheres, and high temperature processes. Ceramic pressure sensors are an ideal alternative to conventional oil-filled pressure sensors under such circumstances. Because of their unique construction and ceramic’s chemically inert nature, ceramic pressure sensors can withstand harsh atmospheric conditions without sacrificing performance. Robust, reliable, and washable, they are a durable and cost-effective solution to a variety of demanding applications. Ceramic pressure sensors have many advantages over traditional stainless steel counterparts. Perhaps most importantly, they are significantly stronger than oil-filled diaphragms. Similarly, they can withstand high operating temperatures and pressures without losing sensitivity at low pressure values. They tolerate relatively high over pressures as well. Since ceramic sensors do not rely on oil, the diaphragm can be thicker, and it does not carry the risk of a leak that could compromise an entire batch of sensors. Because they are sturdier, ceramic pressure sensors will not deviate from their calibrated setting even after multiple operating cycles, thus minimizing the risk of sensor drift. All these features make ceramic pressure sensors ideal for a large number of industrial applications, particularly if accuracy, dynamic range, and corrosion resistance are critical requirements. 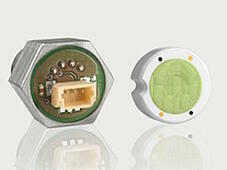 Ceramic pressure sensors are suited to a wide variety of industries. In the automotive industry, for example, they are often used to measure oil levels. Within the transportation industry, they are used to maintain hydraulic systems (which benefit from greater water resistance) and control emissions (where greater resistance to heat and corrosion may be necessary). They are also used to measure the flow rate of the working fluid in water reservoirs, waste water treatment plants, and other chemical processing plants. The high strength of ceramic sensors makes them ideally suited for applications that feature a large number of pressure cycles. Because of ceramic’s chemically non-reactive nature, they can be used in HVAC systems to measure refrigerant levels and for flow measurement in the oil and gas industry. They are also inert enough for used in food and beverage industry to monitor ingredient flow. For the last 30 years, Servoflo has offered technical support, product optimization, and system design services to users of pressure sensors in every major industry. Trusted by companies of every size, our pressure sensors can handle difficult applications with accuracy and efficiency. In particular, our ceramic sensors offer unmatched quality and reliability in industries ranging from aerospace to waste management. Regardless of your demands, Servoflo can help you meet any requirement. 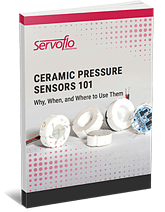 If you’d like to learn more about Servoflo’s ceramic pressure sensors or discover how they can improve your business, download our “Ceramic Pressure Sensors 101: Why, When, and Where to Use Them” eBook today.